A great fully protected summer jacket from Knox with a competitive price & excellent service from Sportsbikeshop. Thank you. Had the jacket a couple of weeks now, found it excellent quality with very good protection. Had to go up a size due to snug fitting. Nice to have a cool breeze blowing through the jacket. Sand colour purchased to get away from black looks good off the bike. Useful pocket on rear for small items or the Zephyr waterproof over jacket. Would recommend to anyone. Great service from Sportsbikeshop. 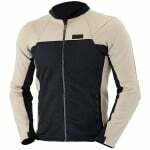 Designed specifically for summer riding, the Zephyr is a stylish, tough and highly breathable fully armoured motorcycle jacket. The Zephyr gives the wearer freedom to ride confidently and comfortably in warmer climates, knowing they are protected. THROAT GUARD - A studded removable throat guard attaches for extra weather protection. The jacket collar can be worn up or down and there is an interior knitted collar and cuffs that can be removed in warmer weather. MAIN ZIP - YKK Aquaguard water resistant zips are used on the centre front zip. Knox branded gun metal zip pull. YKK Aquaguard water resistant zips are also used on 4 exterior pockets, 2 side entry waist and chest pockets. COLLAR - Soft ribbed collar for added protection against the cold in the winter months which is removable in warmer weather. The outer collar can be worn up or down. CUFF - An adjustable cuff closure system to enable easy fitting of gloves and a snug fit. Soft ribbed cuffs give added warmth and these are removable in warmer weather. 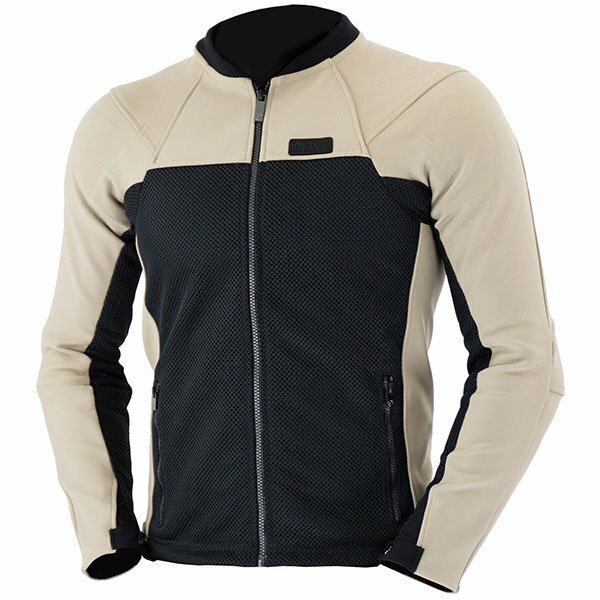 DUAL FIT ZIP SYSTEM - A unique dual fit underarm zip system changes the fit of the jacket on the arms and body. 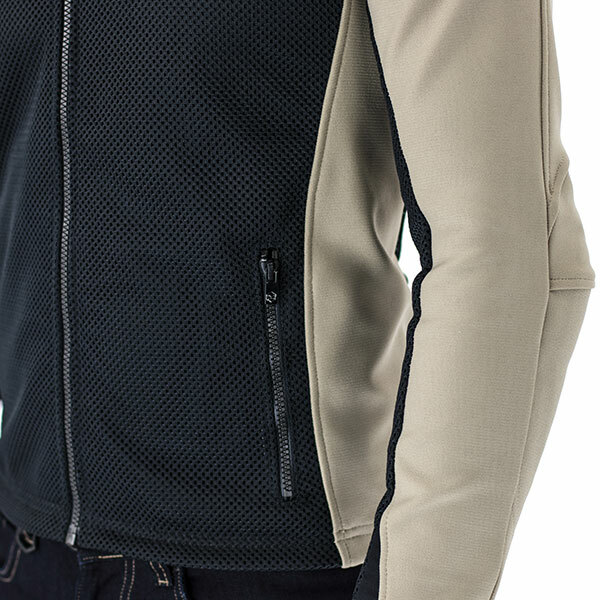 Open the zip and the jacket becomes bigger allowing armour and warm layers to be worn comfortably underneath. 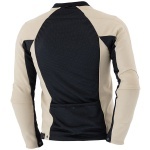 Off the bike, remove the armoured layer and close the underarm zip system for a perfect fit. KNOX BRANDING - Discreet Knox branding on the sleeve and at the back of the neck. 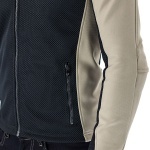 Gun metal branded fasteners and rivets are used on the sleeve, pockets and front. Finished with a soft felt Knox branded badge on the chest. WITHOUT COLLAR - Wax collar can be worn up or down and is finished with branded Knox gun metal stud fastening. DRAW CORD - A concealed interior elasticated draw cord and stopper adjusts the fit of the jacket on the hem. Knox is a British company that has been at the cutting edge of impact protection design since 1981. Their brand partners from around the world are some of the biggest companies in motorcycling that trust Knox and benefit from fitting Knox CE protectors in their garments. They have a very experienced team of experts who understand garment construction. Knox is the company behind the multi award winning Knox brand of Body armour, Original Equipment, Hand armour, Cold Killers and Dry Inside.